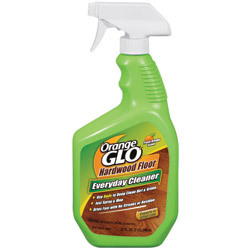 Jessa has shared her review of Orange Glo Hardwood Floor Cleaner, in the spray bottle, called the "everyday" cleaner. Overall, I am not extremely happy with this product. It cleaned my hardwood floors pretty well. The surface looked shiny and clean, and was also glowing in the sun. In addition, it also has a sublime orange scent that remains for some time. However, my main concern is with the finish it leaves behind. After applying the cleaner, once it dries, the floor becomes too slippery to even walk. I was not able to do anything for this and it kept irritating everyone in the house, including our dog who kept sliding over the cleaned portion. There should be a better way to do it without having to deal with the sliding (dance floor like) surface. The cleaning ability may be very very good but the after work required in order to protect the children from not hurting themselves is just too much to deal with. Therefore I may use up the bottle only when required, but won't be purchasing this again. Jessa, I am sorry to hear that the Orange Glo hardwood floor cleaner did not work well for you. I would not want to use a product either that made the floors slippery, because this can be very dangerous. I would love to hear from even more people who have used this product to share how it has worked for them. Have you had problems with the floor being slippery? Is there anything you can do to reduce or eliminate this problem? Please share your hardwood floor cleaners review here, for this or any other brand, telling me how it worked for you, and why you like (or dislike) it. In addition, you can read other reviews already submitted. In addition, I have received additional reviews of another Orange Glo product, the 4-in-1 wood floor cleaner which promises to both clean and polish your floors, at the same time. You can read this Orange Glo wood floor cleaner and polish review here. AJ shared his experience with this product. My house is 103 years old, and the floors were last refinished in the late 1980s. This product does an excellent job at cleaning the floors and restoring some shine, and I've never had a slipping problem. That said, I spot-cleaned some older trim (original to the house and with the original finish) and it stripped the stain and finish right off. Thanks for sharing your experience with me AJ. I have personally never used this product, but having it remove the finish off hardwood floors doesn't seem good to me. I'd like to know if anyone else has had this problem. If so, please share your review or experience with me here. I just finished 20 hours of on my knees work to remove this product off my 2 year old exotic wood floors. The sticky hazy waxy build up was horrible to look at and walk on. Every single footprint was visible in the sticky gooey mess left behind. Hair and crumbs etc. were stuck in piles of it around the edges. There was literally no way and no product that could be used to clean or make the floors look better. I was just days away from calling in a floor refinisher....I was desperate! We literally couldn't sell the house because of how horrible the floors looked. After researching on the Internet I did work out a way to remove this absolutely horrible product from my floors. Don't be fooled by how amazing this product will make your floors look after a couple of uses...beyond that you will be pulling your hair out and cursing the day you ever used it! Dawn has shared what she likes, and doesn't, about Orange Glo hardwood floor cleaner, and also asked for some cleaning help from me, at the same time. I have had great luck with the Orange Glo for hardwood floors. It really leaves a nice shine and nice looking floors. The only problem is slipping. But not on all floors, just the one in my bathroom in the area next to the sink. I am wondering if it is a combination of Orange Glo and my hair spray, as it is in the area that my hairspray typically falls. There is nothing else that could be falling on this spot in the floor that does not happen throughout the house, so I feel it really must be some reaction that occurs. No matter what I have tried (even rubbing alcohol) I have not been able to get rid of this build up. 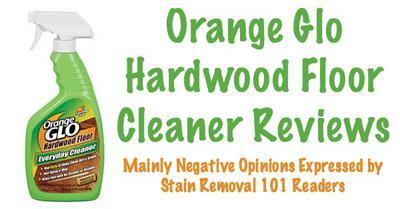 Thanks for your review of Orange Glo hardwood floor cleaner Dawn. Sorry to hear you're slipping around anywhere because of it. Actually, the reviewer above, Jessa, also had a problem with slipping with this cleaner, although she experienced the problem everywhere, not just in one spot. I would be curious to hear from others to share their experiences about whether this product causes slipping for you too. In regard to your issue, I'm assuming that your bathroom has hardwood floors, even though you did not say this. If so, I would first suggest putting a mat down on the floor where you stand to spray your hair spray, since your wood floors should not be covered with hairspray, since it could harm them. As for the Orange Glo slipping problem, normally I would suggest using ammonia to remove the residue. If you somehow get this product on your tile floors, for example, this is exactly what you should do. However, ammonia is not normally a product I recommend for cleaning hardwood floors, since it can cause discoloration and damage to the floor, especially in heavy concentrations. Therefore, if you use ammonia to remove the Orange Glo you'll need to exercise great caution. First, don't use undiluted ammonia. Instead, you should dilute it as much as possible so that it still works, but no stronger. Further, work in a really small area at a time and immediately rinse it off (of course, never soak wood, so when I say rinse, I mean wipe off with a clean cloth). Finally, before you even begin, I would suggest testing your ammonia cleaning solutions in an inconspicuous area of your wood floor, to make sure it will not harm or discolor the surface before you begin. I'd love to hear from anyone else who has any success with removing Orange Glo from their hardwood floor, and would like to share how they did it. You can share your cleaning tips here sharing what worked, and didn't for you. I've answered this question as part of the cleaning help section of the site. You can ask your own questions too, or see what kinds of other questions I've already answered! When I used this product it messed up my floor so bad. I watch how to use in YouTube, suddenly make my hardwood miserable. This product isn't good and so sticky. Now I struggle with how to remove sticky in floor. I recently used Orange Glo on my kitchen floor. The finish became so incredibly slippery I fell, broke my elbow, now require surgery and will never have full range of motion again. Beware! I know this sounds hard to believe but it's true as can be. I am sooooo sorry to hear this about your elbow. I actually fell and broke my elbow on ice several years ago, which required surgery to repair. It was horrible and with physical therapy I did get most of my range of motion back, but still not completely. I hope you feel better soon, and I will say although it hurt, a lot, when the PT would stretch and push on my elbow to increase the range of motion, or make me do things to do the same thing, it has helped immensely. can it be used on floor tile? This product was recommended by a friend, can it also be used on floor tile?